'I loved my wedding dress! And more importantly, I loved wearing it! Months after my wedding I'm still forlorn that I can't wear my gorgeous dress again. Olwen did an amazing job of translating my vision for a dress into reality. She completely understood what I was technically looking for in a dress and how to build it so that it incorporated my personality and made me feel and appear how I hoped I would on my wedding day. Many of my friends and family commented that my dress was 'so me'. Working with Olwen was fantastic - it really felt like anything was possible, the only limit was my imagination. The fitting process was a joy, and so relaxed, and it was great to not only see the dress taking shape, but also tweak things as we went along that didn't work or weren't 100% right. Her attention to detail is just what every bride needs and I came to really cherish the chilled out time spent in her studio. On the day, wearing the dress was just heaven (I'm welling up now thinking about it!). The fit was perfect - light and floaty, and exactly what I'd wanted. I could have swirled around on the dance floor all night. And most importantly, Jon loved it! The dress could not have been more perfect. The cowl was well trained, and behaved just fine on the day. I felt super glamorous and perfectly comfy all day. I really, truly loved it. Absolutely my perfect dress. I had some general ideas of what I wanted the dress to look like. Olwen took these ideas and with her incredible creativity and vision she created a wedding dress more amazing and beautiful than I could have wished for. It was a great experience working with her. She has a great work ethic and is motivated yet relaxed. She also knew exactly what would work for me and was not afraid to experiment. She was very collaborative throughout the process taking on board my thoughts and combining them with her own inspired and innovative ideas to produce a truly unique, one of a kind, dress that made my day even more special. After the gaudy bridal shops, Olwen's studio was a breath of fresh air. Olwen is talented, warm, great at what she does and quickly understood what I wanted. It was wonderful to see my bolero, sash & Clara's dress being created over the several fittings. The gorgeous bolero and sash matched my dress beautifully and Clara's dress was just perfect! Thank you again for making one of the most beautiful outfits I will ever wear! I felt amazing on the day and had so many compliments! I was recommended/introduced to Olwen by a friend who knew I was looking for something bespoke for my wedding. After seeing examples of Olwen’s work and meeting her, I was confident she could create what I wanted. After collecting images, photographs and chatting with Olwen, the handmade vintage looking silk flowers were exactly what I wanted. Olwen was easy to work with and knew how to interpret what I had in my head to something I could wear. 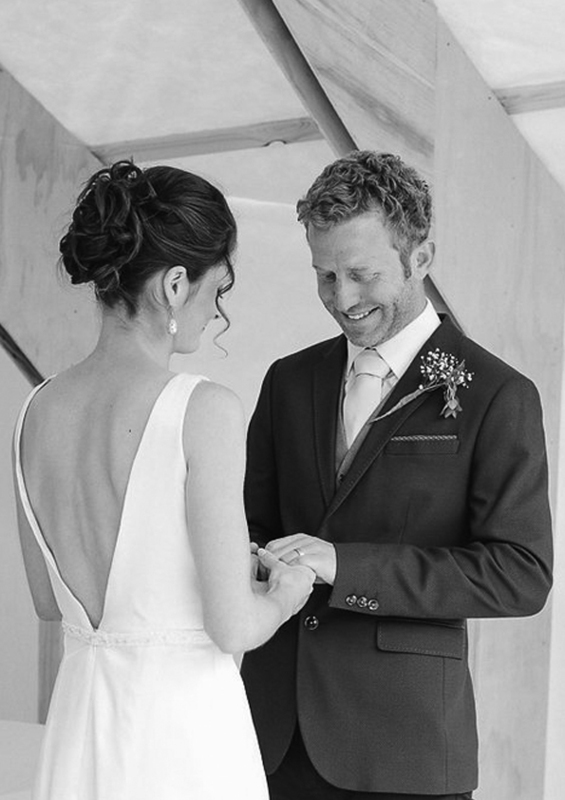 Olwen captured my preferences effortlessly and I immediately knew she would create the perfect bridal jacket. I had so many compliments and I simply love the stylish, elegant feel. Thank you from the bottom of my heart for this most beautiful piece and for making me feel so special on my wedding day. It will stay with me forever. Olwen made me a beautiful black dress for a special occasion. It was my first experience of having a dress made and probably the best ill have. Firstly working with Olwen closely to make my perfect dress was just wonderful - from her East London studio with stunning view to the gorgeous reclaimed fabric, I not only loved wearing the finished product but the making of the dress was a wonderful journey too. When wearing the dress I felt so great, and most importantly I felt myself because Olwen tailored the dress not only perfectly to my size but also to my taste! I've worn the dress a few times since and love sharing the story of it with others that compliment it. Highly recommended!